We told this anecdote a couple years ago as part of a longer story about a whirlwind trip from Beijing to Taishan that provided us with several "cultural moments." You can check out the longer story in context here. Meanwhile, Brian had captured the moment from his perspective for a class assignment last night and we figured we'd share it again. Life teaches many lessons. 10 minutes in a Chinese train station taught me that sometimes, you have to embrace the local culture and dive in headfirst. 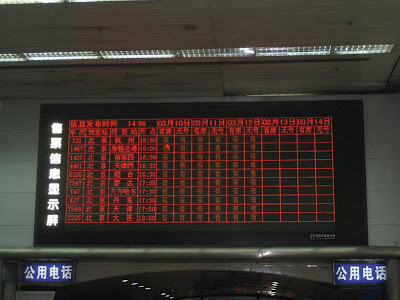 My wife and I had arrived at Taishan station after a long 24 hours; a night train followed by a nine-mile hike that had a 9000-foot total altitude change. Our reward? Dead legs, and another night train complete with rice bags in the aisle, unfiltered cigarettes in the air and about 100 of our closest Chinese friends to every side. We stood in a line at the departure gate, waiting to board. Yes, a line. My personal need for order was fulfilled for the first time during our Chinese travels. I was skeptical but feeling positive that for the first time in our time there, I might be rewarded with an American sense of order. A second later… it was gone. So was anybody whose ticket had been checked, sprinting down the platform. With legs like jello and resigned to our fate, we limped to the platform. Amoebas were forming on the platform, waiting for the train. Bam. The train is here. The amoebas turn to anarchy as 50+ people frantically try to push and shove their way onto our train car. We suddenly were worried about not being able to get on the train at all. Becca noticed the opposite side of the carriage opening up and ran down to tackle the smaller crowd. I saw her disappear at the door and with the hope she was on the train, I went to work. Now I consider myself a gentleman. I may not always have the most refined of tastes but I was raised in a midwestern family. I still hold the door for women, say please and thank you and in general behave like the Boy Scout I used to be. It was tough being in China to that point. Cultural difference in behavior had left me with an opinion of people as rude. However, as I looked up at the crowd in front of me, I knew I had to get on that train. I tightened my pack straps, and charged into the crowd. I started plowing through people and was towards the front of the line when I got knocked off balance. I look to my left and there is an 80-year-old grandmother blowing by me. My first thought? It’s go time. I got right behind her and grabbed the rails on both sides of the train. I lifted myself up and over the grandmother, and onto the top step of the train. You know what? No one even flinched. I may be a Boy Scout but sometimes it’s more important to be a local. After many years of being the cool friends who enjoy everybody else’s kids (and after a couple of months of practice being the new aunt and uncle) it’s really nice to be able to share the news that it’s our turn now. The little bundle of chaos arrives the end of March, 2009.